Try to imagine that this Halloween you will be the real archer! You can be sure that it will bring you so much pleasure and benefit! Do not forget about your main goal the hidden pumpkin! Check your archery skills and show everyone who you are. We know that you will cope with it at any rate! This Halloween will bring you so many surprises and different exciting suddenness! That is why you have to be all the time on the alert. In this game your goal is to hit all targets. And your main aim is to find the hidden pumpkin. Here you have to be really attentive, cause your targets could even move! So try to aim at the orbs through different unexpected and crazy impediments. 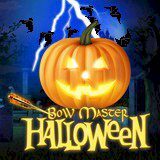 Your role this Halloween is to be the brave archer. As more exact or shot will be so more points you can get! This night may belong to you!